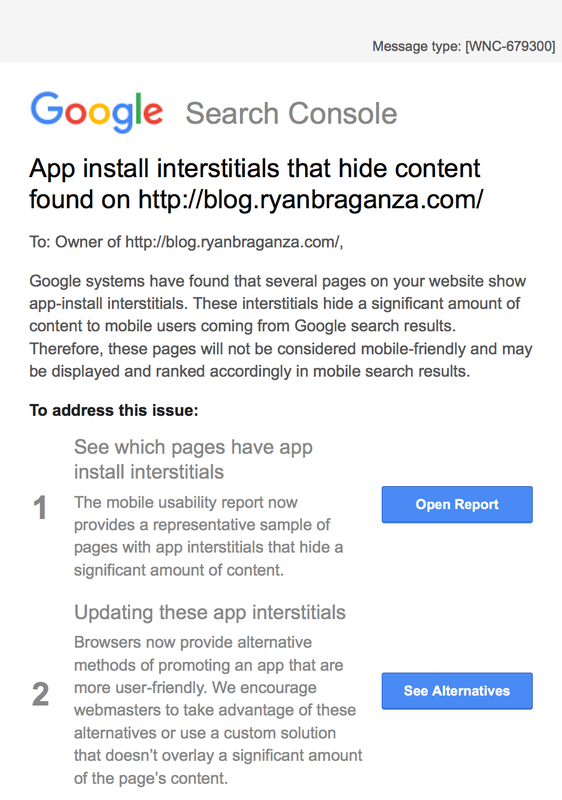 A few months ago, Google announced that they'd be updating their mobile-friendly test, penalizing sites which present app install banners over the main mobile content. I didn't have any mobile apps to promote, so this change would only affect me as a user, not a site owner. I promptly forgot about it. But if that's where the story ended, this would be a tiny blog post! Shortly after the change went into effect, I received an email with the subject of "App install interstitials that hide content found on http://blog.ryanbraganza.com/" What was going on? I opened up my blog on my phone and, as expected, I didn't see any app install interstitials. I did see something curious, however. When my blog loaded, my most recent post would slide in from the bottom - up and over the second-most recent post. It wasn't that I had an app install banner obscuring my content, it was my content that was doing the "obscuring!" I chose a different theme, reran the "Mobile Friendly Test" and now all is well.